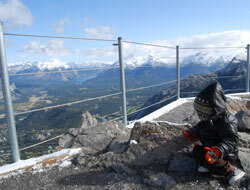 Ride to the top of Sulphur Mountain in Banff to experience a bird's eye view of six mountain ranges. Banff Gondola is located just 5 minutes from the Town of Banff and easily accessed by Banff's "Roam" transit system. The gondola is located on the shoulder of Sulphur Mountain, in the heart of the Canadian Rockies. The 360 degree view from the upper gondola terminal, view-decks and Summit Ridge interpretive boardwalk, are the very best vantage points in the west. Safely seated in 4 passenger gondola cabins, you will be transported in 8 minutes to the summit at an elevation of 2,281m (7,486 ft) above sea level. At the summit, the gondola upper terminal offers restaurant options, a gift shop and a spectacular roof top observation area with interpretive material giving directions and distances to major cities of the world and commemorating the area's designation as a UNESCO World Heritage Site. Stroll along the boardwalk: there are more view-decks on the main level, as well as the start of a 1km long elevated board-walk that leads visitors along Sulphur Mountain's summit ridge to the historic Sanson's Peak Meteorological Station. Banff Gondola located beside Banff Hot Springs so take a dip after your ride for a small amount extra! Private and group guided tours available with Banff Gondola included. The Banff Gondola is FREE with some of our ski packages.